Make the ultimate treat for a truck-lovin' kiddo with chocolate cake, COOL WHIP and crushed OREO Cookies. Best part? It looks better when it's messy! Prepare cake batter and bake as directed on package for 13x9-inch pan. Cool cake in pan 5 min. ; remove from pan to wire rack. Cool completely. Cut 2-inch-wide strip off one side of cake; cut into shapes to create boulders. Frost remaining cake with COOL WHIP; sprinkle with cookie crumbs to represent dirt. Place boulders in piles on top of cake. 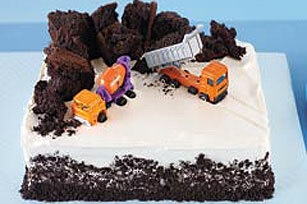 Place clean small toy construction vehicles on top of cake. Kids can have fun helping decorate this cake. At 14 servings, this crowd-pleasing cake is the perfect size for a birthday party. Bake cake a day ahead, cool and cover with plastic wrap. Decorate the morning of the party, loosely covering boulders with plastic wrap to prevent them from drying out. Refrigerate until ready to serve. Use additional cookie crumbs to cover sides of cake.